Being in the profession of music and media from almost two decades, I feel thankful to be associated with this tough but ecstatic world of creative expressions with HIS BLESSINGS. Movies remained the first love always since childhood and the passion for writing got over me since the early nineties beginning with poetry and songs which later helped me a lot in my musical associations. However writing about movies and the life teaching lessons in them began post 2000 when a friend introduced me to the magic of World Cinema through the medium of DVD and World Wide Web. The exposure to the works of masters all over the globe opened new creative doors for me when I got to see many gems which were actually the original films from where many Indian masterpieces were inspired or even copied. And that's when I started writing about all those "Inspired films" and "Must Watch Movies" in the year 2006. 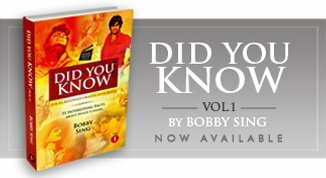 The favourable responses to those early short write-ups made way for my own personal website "bobbytalkscinema.com" which further resulted in writing reviews of all new Bollywood Films as a critic at few movies sites and for some selected publications. "Munshi Ji, Apni Zindagi Ka Tambu, Teen Bambuon Pe Kharha Hai. Music, Shaayri Aur Filmein ........ Agar Ek Bhi Bamboo Nikal Gaya To Hamara Tambu Ukharh Jayega"
So I love being surrounded by movies, music, poetry and books as my healthy food for living all the time. The write-ups on these topics are regularly read and appreciated by all friends here at the site coming through several links, search engines and direct recommendations. The regular postings are also linked through Facebook and Twitter which enable many more interested friends to join in at a regular basis. So, if you are also a movie-music-poetry freak and believe in enjoying life filled with creativity then we are already friends and you are most welcome in this world of articles, reviews, features and research work showcased here at bobbytalkscinema.com. Its indeed my pleasure to share all I know and feel with an extended family of mine visiting the site and I would love to read your valuable comments on the same as that will be my guidance for all my future works. My name is Daniel Allen and I work for Discovery, the in-flight magazine of Cathay Pacific Airlines based out of Hong Kong. I am currently putting together a short piece on Bollywood, and more specifically the current crop of Bollywood movies based in Delhi. I was wondering if I could ask you a few questions about the trend toward making more Bollywood movies in Delhi rather than Mumbai. 1.) A number of Bollywood movies have recently been released (or about to be released) based in Delhi, rather than the traditional setting of Mumbai. What do you think are the reasons behind this change of location? Are there things that Delhi can offer film makers that Mumbai cannot, or is is simply about freshening things up? Are Indian audiences tired of Bollywood movies based in Mumbai? 3.) How do you see the future of Delhi in Bollywood movies - do you think a growing number of movies will be produced in the city, or is this just a temporary fad? How does Delhi film production scene currently can be seen compared to Mumbai? Thanks for visiting my blog and reading through my articles. Your encouraging request inspired me to write a whole article on the topic. So here it is as my latest post on the blog..
Hope you get what you were looking for..
why dont you write for Passionforcinema.com. Just to brief you about PFC, its a leading independent voice on the Internet for film fanatics and filmmakers around the world. The website is organically growing into a cinema portal offering many tools and services for the filmmakers, working professionals in the film industry and film fans. passionforcinema.com went online in September 2006 as a community website designed to bring together all movie fanatics, cinema lovers and those who eat, breathe and drink cinema in one place to review and discuss movies, movie related events, movie personalities, personal opinions, and to share personal knowledge on technical aspects of the medium. It has since grown to become an influential voice for the leading edge filmmakers and directors in Indian cinema, as well as an important source of news, editorial content, and movie reviews related to Indian and world cinema. Some of the regular industry people on the portal are - Anurag Kashyap (Dev D), Sudhir Mishra (Khoya Khoya Chand, Chameli, Hazaroon Khwahishe Aisi, Dharavi), Khalid Mohamed (a well knows writer and critic), Partho Sen Gupta, Hansal Mehta (Dus Kahaniya, Chhal), Suparn Verma (Ek Khiladi, Ek Hasina), Abhay Deol (Actor), Dibakar Banarjee (Oye Lucky, Lucky oye), Onir (My Brother Nikhil, Bus ek Pal), Kundan Shah (jaane bhi do yaaro, Nukkad on DD1, Kabhi haa - kabhi naa), Revathy (Actress), Santosh Sivan (South) etc to name a few. You can contunie writing for your own blog and at the same time you can write articles for PFC as well...the only thing which need to be done is to mention "originally written for passionforcinema.con" on your blog. Your blogs are so nice that let the world read it. Over a period of time, you can be a featured author and you will be interacting with the film makers which are on PFC. Also you need to popularise your blog as not many knows about this blog and me too get it from some reference. Thanks a lot for appreciating my articles and it is really very encouraging for me to have such a response for my passion. I have sent you a mail regarding your suggestion on my writings and making the blog more popular. Would love to write more and reach wider audiences. Finally there is a place where all the movie reviews are written without any prejudice. I wonder how some of the worst movies get an opening collection amounting to 30 Crores.. 40 Crores.. 50 Crores..
Blue is claiming to have collected 92 Crores..
That's the worst way to spend money. Even after CC2C, 8*10 Tasveer and Kambakht Ishq, I wonder how people dare to spend such a huge amount of money for Akshay Kumar movie without any feedback. This website is a must-read for all. I wish you'll continue to review upcoming movies without any bias towards big budget movies. First of all thanks for your kind appreciating words which in turn gave me more energy to continue writing about movies without any personal liking and bias. I always wish to give my reader friends a clean review of a movie ir-respective of any cast, director or production house. And I will surely try to keep writing with more higher spirits about all the forthcoming movies in the coming months . So please keep logging and do spread a word about the site in your friends circle. Your valuable comments on my write-ups are eagerly awaited at the website. I really enjoyed reading your reviews and the information which you have arranged. Thanks for sharing this with the internet users. Keep doing this good work. I love indian movies and my favorite list is same as yours. Thanks Chahel for your appreciation and truly speaking, this is what keeps me going. A few words of encouragement push me more hard to keep finding time and adding loads of stuff I have in store for all my fellow readers. Thanks once again and do keep visiting.. I just romed through your blog and website and i must say i found one more place to explore the art of cinema. Thanks for your positive response......I hope you like my write-ups on different topics of entertainment here. Please also share yourself with few comments too. Thanks once again and keep visiting......Cheers! I am big movie buff and always search for quality cinema. For me.. cinema is a lot more than just a storytelling... it's rather presenting a story with all the spectacles one can put into it and gives it the dimensions beyond just a script or story and i think on this note western cinema is far more ahead than us. At your space, I was amazed to see, the so much empasization you have given to Indian cinema which seldom rises on an international scenario. I am not saying that Indian cinema is bad or something like that, Indian cinema has it's own unique way of storytelling which is a proud thing for us but I just feel that nowadays Indian moviemakers are not honest with their work, they are more like moneymakers rather than good storytellers. That's why I surprised to see the names like Rajkumar Santoshi and Ram Gopla Verma on your list and not like Anurag Kashyap or Meera Nair. I have not seen your full list of movie to see before die but some i think some of the movies should be there like Raiders Of The Lost Ark in Adventure,Alien in Horror/Thriller, A Beautiful Mind and The Aviator in biographical etc. This is not necessary that you should agree with my views this are my personal opinions. Glad to have another friend who takes Cinema more than what its normally famous for. Regarding the empasization I have given to Indian cinema, I would like to add that the movies rightly deserve to be there in my list and I am proud of that. Actually the problem here is that you are mostly considering the Indian Cinema you may have seen in the last 3 decades. Whereas actually the beauty of Indian Cinema and its classics lies mainly in the works before the eightys. Now most of our net savvy friends of today would have to do a lot of research and also got to have a lot of patience to watch those mesmerising classics of the past. Becuase you just cannot see them after watching a "Fast & Furious" or "Next". So if your really want to have an idea of what i am saying then just search my list and go for all those classics at the earliest. Regarding the names you have taken, if you havent seen "Damini", "Ghayal", "Andaz Apna Apna", "Halla Bol" & "Pukar" then you really are unaware of the power of a director called "Raj Kumar Santoshi". Please dont judge him with his recent movies. And Ram Gopal Verma is a person who is responsible of very much changing the movie making style in India. He came with new ideas of even shooting a film in his cult movies like "Shiva", "Satya" and his earlier horror flicks. Yes, Anurag Kashayp is a director who needs to be there in my list, that is fine. But I dont consider Meera Nair of that greatness because she has always tried to cash either the poverty or the ancient culture of India to gain attention in the west. He glorified these elements in her "Salaam Bombay", "Kaamasutra" and to some extent also in "Monsoon Wedding". Only her "Namesake" was the movie which impressed me the most. And from the list of English movies, I dont highly appreciate movies which are mostly dependent on graphics, exaggreated things and wierd fantasies, because they cannot contribute anywhere in your personality development. I am all in favor of movies such as "A Beautiful Mind" which is already there in my list. I add the movie in my list on the basis of how important that movie can be in our lives which we go on living unknowinlgly. I hope you would have got all your answers now........but in the end I would again request to see all the Indian Gems from the past.......Any movie lover anywhere in the world is simply incomplete without seeing them. You are very right in your comment. Lets see what's there in store in the most expensive film of Bollywood "Blue". Thanks for apprecaiting my writing skill. Yes I am a professional in the media field (mainly music and films) and now also writing for few websites and publicatons too. Thanks once again for visiting the site and giving your valuable comment. I would like to say, Bobby Da always writes perfect reviews of Hindi Movies, really very honest and it saves our times. I have read other reviews like Taran Adhesh and on other famous bollywood sites, it looks like they are paid to write a good revire of flop movies. But Thankfully we have an honest REviewer of a movie, Bobby da, whoz reviews are interesting to read. and speiclaly in todays fast lives, we don't get much time to see all movies, only the best we can see on every weekend. and Bobby Da again writes an excellent review of all bollywood movies. The most favourite review of bobby da is Main Aurr Mrs Khanna. movie is a super flop, but i loved the review really. i wish i would have read it before going to Cinema. Wasted my money and time. That was indeed a very encouraging comment from your side and thanks a lot for your thoughtful appreciation. I am honored to know that my site and my writings are being valued by me friendly readers and that really gives me immense strength to keep on going. I would try my best to maintain the standard of this site and its articles in the future, so please do keep logging and will surely be looking forward for more comments from you at the site. I am glad I found your site. I love poetry, movies, music. I have eclectic taste but Urdu, Persian, Qawwalis, Ghazals have a featured place in my heart. Great site. Thanks Nora for your kind words. I hope my articles match upto your rich taste. Actually everyone has a hidden passion inside, but its only the other important things in life which take away most of our times and we are left nothing to feed our passions. Hence, I strongly believe that we all should take care of our hobbies and passions in our life, irrespective of any age or social factor coming in the way. Thanks for your kind comment and Keep Logging! Good to learn you're doing so great with your hobby. I'm a corporate writer who occasionally does film reviews. Will keep track of your future posts. Thanks for your kind comment and keep visiting. Hoping to convert my hobby into a commercial venture too very soon. Thanks for your kind comment. I will certainly try to give my best to all the movie lovers here and hope all my readers are benefited a lot with my reviews and articles on movies, music, poetry and life. I am honored to have such an answer as well as such an honest approach. I value your passion and expression as well. I am sure going to visit this more often as we share same passion as such. Kindly do me a favor, Have you seen Perfume? I am curious to understand your views about it if you can? Thanks a lot Vinay Ji for supporting my passion and love for the medium. Yes, I have seen Perfume, a while ago. I liked the movie mainly for its treatment and art-direction, but the theme couldnt impress me a lot to be frank. May be I had heard a lot about the movie and then watched it with great expectations but the movie alltogether couldnt leave a lasting impact on me. But now as you have specifically mentioned it here, I may watch it again as I get hold of it soon. Educate me please as to what was your motive to start this blog? What do you feel is essentially required for and from a film critic ? Regards and indeed must say you have been putting great efforts. Liked your site for sure. Thanks for being here and also appreciating my honest efforts here. Regarding your question of what was the purpose or motive to start this site ? "I strongly believe that a person must have some passion in his life to be with, to enjoy and to cherish each day in life. As I have seen almost 90% people start dying very slowly right after the age of 30. Thats because they dont have any passion as such, if all they have any then honestly they want to enjoy it just for free without spending even one penny on it. And thats how they simply start melting away with time fulfilling the other essential requirements and responsibilities of life. Technology today has blessed us with such tools with which we can share what ever we know with the entire world in just a few minutes and thats what fascinates me, excites me and pushes me to keep going at my site. The responses, the contributions and favourable echoes from all ove the web become the much required fuel for my efforts and I am just willing to share more & more as the time passes. I have been teaching for quite a long period in life and that has tauhgt me that whatever you know, whatever knowledge or expertise you have in a specific field, it grows with sharing and there is no use keeping it inside your mind like something kept in the closet. So thats my basic purpose of starting this site. Moreover all the friends here, have even taught me and made me aware of such great things which i was not known to before and that keeps my learning process on with each new day of life. Hence this is my answer to your simple question. Regarding your question on What do you feel is essentially required for and from a film critic ? In answer to that I would like to say that Critic is no final authority on a product. And further a critic should not be a person who is interested in satisfying any particular person, production house or media. As I see it, an honest critic is one of the normal filmgoers who is well aware of the finest details of the medium and doesnt take Cinema as just another means of entertainment. He is a person who has majorly seen cinema and classics from all over the world, should be essentially working in the industry (knowing how it works from the inside) and is capable of expressing his personal views on a movie in a readable manner. However it is not necessary that his views should always match with the general resonse of the public. A critic should always be giving his sincere and honest view on a movie irrespective of any other influences on his mind, which sadly is not the case in the real world. Here, an honest reviewer can even get thrown out of the job only becuase he didnt praise a movie of a director close to the publishers. And a movie may also get more stars just because the makers had arranged a private show for an individual critic only last evening. So, we have both kinds of critics all over the world. One who writes for satisfying others and one who writes for his own self. I dont know how you rate myself in those but thats what I feel about being a critic. I hope I was able to explain myself clearly. Thanks once again for visiting and would love to see you here again. Pleasure is all mine Bobby ji. No issues dear, you don't have to watch it again as second opinion is calculated one. First expression is the one which values as such. Like it, so sharing it with you as it speaks about my take about the Critic. Completely agree with it Sir!.....Cheers! I could not find music reviews of Raavan. Kindly send me the link. Though I have thought about it many times, but still I havent started writing any music reviews at my site. But will sure inform you whenever I will. 1. The site interface is awesome,this is wht u call a movie site, i felt like i'm enjoying my browsing experience, a first for myself. something which u can compare with like spending some quality time in a cafe. I've surfed a lot of site of english movies , like rottentomatoes, IMDB, wikipedia, roger ebert. etc. the beauty of your site is it is the finest on indian cinema. I'm not writing this after spending a whole day on your site , but just read a couple of reviews and said ...THIS IS IT. I really appreciate your knowledge on movies and the thought of sharing it with the world. 2. A more detailed info on yourself would be appreciated. 3. In fact , u will be surprised to know how i landed on your site, after watching the movie once upon a time in mumbaai, it has initial credits thanking bobby singh, i was curious who is this guy , whom balaji ppl are thanking, so just googled around and landed on your site, still wondering whether you are the same bobby, but got a great site on cinema. Your review on Once upon a time .... is the only one on the net which is apt and informative. Other reviewers seem to be marketing agents. A) Roger Ebert is missing on your site. C) A mobile app in future is appreciated , since 3G will be here by diwali. Such comments mean a lot to me as this is my passion for which i devote my time, efforts and energy with the only motive of sharing whatever i know about the medium with all like-minded friends. Regarding your other points, more info about myself can be found at Linkedin.com, which you might be familiar with. And yes I know about the opening credits of "Once Upon A Time in Mumbai", which is responsible for all the calls and mails I am getting nowadays. But to be truthful it doesnt refers to me and I think it is for the Cinematographer who happens to have a similar name like mine. Anyway the coincidence has indeed introduced me to many new friends in the web world which is simply great. On a lighter note after reading my honest review on the movie I doubt if anybody related to the project would like to thank me in the first place. For your suggestions, I would surely work on it. But the SEARCH OPTION is right there in the site in the middle of the right column which somehow gets overshadowed by the other elements around it. Rest your comment made by day and filled me with more energy to continue in the same manner forever. There is lot more to write about and share with all the friends here and I really wish I could have more hours in a day to write on a more regular basis. Once again a big thanks for your time and comment. Be in touch, Keep Visiting and writing in. Its pleasure to have this site in my most favorite list. I just found it yesterday by surfing on Google. & i m not getting tired reading it for hours. I become big fan of your writing on diff kind of world cinemas. Your sense & logic behind it is very very impressive. Myself also an intense fan of cinemas & after reading your view become a fan of world cinemas too. Thanks bro for your kind appreciation. I am really glad you loved my articles and would surely try to keep the standards up....Thanks once again and Keep Visiting.....Cheers! Thanks for the quickest reply of my last comment posted on 31st Aug-10. It really makes someone feel connected instantly. There is one small request, I wish that if you increase your frequency to write & upload more articles. Your average update rate is like 1 for 3-4 days. Which is not enough for people like me who are always thirsty for your kind of writeup. Thanks for your keen interest in my articles. Frankly speaking friend, I really want to write more often at the site and also seriously try to do so often. But from the last month the frequency has been slow and I will surely try to update it soon with more articles and post. Unfortunately "For Real" is off from all the theaters now and I would surely let you know when i get to see it on DVD. ru coming with verdict on Khichdi & robot?? Due to my traveling in the weekend, I was not able to post the reviews. but would be posting them soon..Cheers! I would like to point out one serious thing. Hope you got my point!!! One of the big follower of BTC....!! I got your point. Your mentioned graph puts me really into a tough position and sets me thinking.....You would surely get more in the coming months. Thanks for such detailed overview and appreciation......CHEERS! It is really surprising that you didn't posted your review on INCEPTION yet. Which is already @ no 4 on IMDB. It would be pleasure to read your view on that. You might have noticed that I normally not write reviews of New English Movies but add them only if they enter my "MOIVES TO SEE BEFORE YOU DIE LIST". And movies are added on to this list purely on some different considerations which vary with the general concept of a good or brilliant movie. So many times you would notice that the movie which may have 8, 8.5 or even 9 ratings at IMDB will not be there in my list. This is exactly the case with INCEPTION too. I hope you would understand what I meant to say. Sorry for keeping you waiting dear, but the last two months were a little tough and even when I had many things in mind, still coudnt write it in details for all my firendly readers. But I assure you some good articles coming this month for all the readers which I hope would statisfy you a lot. what does music mean to u? as i havn't found any post about that movie in ur site. hope you write abt that movie as well..
Yeah, I have heard about the movie, as many Bollywood movies have been taking inspiration from the same. But now as you have mentioned it I will surely watch it and would let you soon about my views about it very soon. Thanks for your recommendation and Keep Writing in. hi, the library is on from Wednesday, you are all welcome at 8pm.....Cheers! I am a Management Development Consultant and I use movies for Coaching Managers and Business Leaders. I need names of hindi movies which shows "change", "how people react to change", "how people first resist change but later accept it". I have thought of one - Naya Daur (Dilip Kr & Vyajayanti Mala) but need more. If you could kindly help please? Thanks for your visit and comment on the site along with a Sorry for my late reply. 1. Should it be only films dealing with Positive change or both will do? 2. Am I supposed to name only Hindi films or any language is fine? Please let me know about these as then I would be sending you some names. Thanks once again and Keep Visiting. hi bobby, back here, saw phas gaye re obama, awesome movie. in fact saw it thrice. Wanted your review on No Country For old men. I'm a gr8 fan of this movie but want to know it from you, and any similar movies that come to you mind. Thanks for coming back here and glad to hear that you liked PGRO a lot. Regarding NO COUNTRY FOR OLD MEN, I would like to say that its a great movie as far as acting, technicality and concept is concerned. But somehow i didnt felt like adding it to my "Movies to See Before You Die" List. But it was great watching it and enjoyed it a lot. Hoping to see more comments from yourself. You should also add "Back to School" (*Rodney Dangerfield) in the list of inspired by films behind Munnabhai MBBS. There are a two main scenes (one moving to the hostel room, and final open exam in front of the profs' panel) in the movie that are a straight copy of those from Back to School. Thanks Amit for the info bro. Since I havent seen the movie so I cant comment, But now its the next one I will be watching and then would let you know about the same. Surely would love to add it if it has been the source of inspiration behind MM MBBS. Thanks once again and Keep Visiting ..... Cheers! Was just browsing your site for an hour or more and found it fantastic. I have added it to my fvrts bar. Please keep writing. I will write more in individual post's comments box. Thanks Abel for visiting and praising my sincere effort. Yes I would sure keep on writing without any doubt....So do keep visiting.....Cheers! I would like to recommend one movie which i recently watch & i found it very touching & moving. Its named TWO BROTHERS on two tigers as brothers. Pls get some time free to watch. you wont regret, sure. Thanks Himanshu for telling me about this movie as its one line plot really sounds great....Will soon find it somehow and let you know after I have seen it. Do keep recommending such movies as a kind gesture.......Thanks once again! PS: I watched Knock Out and I think India needs more movies with this type of storyline. Movies that depict the "highest" level corruption in India send a strong message and I'm glad the director/producer selected Sanjay Dutt and Iffran to play the lead roles. I don't think they did it just for the money (as you had indicated), I think they also liked the message and wanted to participate for that reason. My hats off to the writer/director/producer for tackling the topic and exposing the MP's and higher levels of the highest level of corruption (versus just some low level politician or cop). I recommend the movie and hope there's a part 2 and part 3 coming!! Thanks for your comment but I think you havent checked out my site completely and therefore not known to its various sections out of which one is "MOVIES TO SEE BEFORE YOU DIE". And "Shawshank Redemption" is right there in that list. Infact it was one of the first 50 movies to make to that list. currently there are more than 250 movies in that section which are a mix of films from all over the world. "Even if you steal something from someone's hard earned earnings for a good reason, that doesnt mean that your stealing becomes justified and you can easily escape with that." I hear you and I understand your point. There's nothing better than an original idea. I just think the way they lifted an existing idea for Knock Out was not all that bad. The message was very strong and badly needed. In Part 2 I'm sure they will come up with an original idea to expose another major SCAM/Corruption in India. I checked your site and couldn't find one concise list of all 250 movies that are recommended but rather categories. One list would also be helpful. Congrats on your site and keep up the great work! Hey Bobby. Looks like you need to do some catching up buddy. You are missing so many great films. You need to go beyond the boundaries of English and Hindi and step into the world films. Take a look at my list of favorite movies I collect around the world and start watching them one by one. Its better than your IMDB listing or any where in the web. Good luck hunting them down in your video store. Oh I highly recommend, if you can find them in Blu Ray, watch it in that. Other than that, all of them are definitely available in DVD. I update my list frequently so keep checking. Happy hunting and keep writing. Thanks for visiting the site and writing in your comment. But Sorry friend I have a different opinion which basically talks about the QUALITY of films and the QUANTITY of it. Firstly I cannot claim that I have seen much, but I am in a continous process and the articles at the site are also the result of that ongoing process of watching films. So admitedly I still have a lot to see. Secondly, I dont feel that our Hindi films made before 70s were anywhere behind any fo the WORLD Classics, So I PROUDLY add all MY FAVOURITE HINDI FILMS in my site. Lastly, after visiting your site and its list with only names and no details or any write ups, I can only say that there is bit difference between collecting movies and appreciating them or writing about them in details. Still I would love to watch all the movies you have recommended and would surely do that in its due time. Once again Thanks for writing in and Keep Visiting. I am glad to have you here at my site and thanks a lot for aprreciating my sincere efforts. Regarding MARATHI Cinema, I know it features some great works of which I am also sent few DVDs by my friends. However I have seen few like Shwaas and more but would surely love to chek out your list sent too. Please be in touch and write more often here as your comments. I own www.gomolo.in. Trying to build user generated content. Please check it out. Would love to have your feedback. Will you be interested in putting your reviews on gomolo, too? Thanks for all your appreciation dear. Nice to see your site too and accept my best wishes for its success. Thanks Bobby for the prompt response and kind words. I found you interesting, creative and knowledge full. You know how to use words to be read Mazzey Sey.. Hope to meet you sometimes to observe you more. ( cReAtIvE Mind - Value added ). Thanks a lot Tahir for your appreciation and would love to meet you too someday. Hope you will enjoy all the articles here and also spread a word too in your friend circle. Just stumbled upon this site today and liked it a lot. Have bookmarked it so that i can keep coming back to it over and over again. Cheers for all the good work you are doing :) . All the very best! Thanks Sheila for your kind appreciating words and best wishes. Do Keep writing in and discussing movies. I love all Sanjeev kumar movies. Really liked your unbiased and heart touching reviews, U have got talent man! U rock. Such a nice review of rockstar. U just dnt watch the film u feel it. Thanks a lot for your honest and encouraging response bro and frankly the words work like fuel to my passion. There is lot to share and explore at the site here and I am sure you would love reading them all. Welcome once again and Keep Visiting. I am from Nasik (Maharashtra), n want 2 say dat i just love your site. Hope u always provide the best abt cinema 2 us. Thanks a lot Harshwardhan, for loving my sincere works. And I would always try to give more & more valuable inputs for friendly readers as yourself who constantly provide me the encouragement to continue this passion of mine with even greater spirits. Thanks once again and Keep Writing in. Hiiiiiiiii.... Mujhe appke Dedh Ishquia pe likhe articles bahot pasand aaye. Infact mujhe aapke lagbhag sabhi reviews padhane bahot achcha lagta hai. Because, of ur depth of understanding of subject, beautiful & intellectual evaluation without any bias. Waiting for ur reviews on "Highway" & "Darr at the mall" releasing today. Also, ho sake to Marathi moview "Frandy" dekhiye aur aapka opinion bataiye. Thanks a lot for your kind appreciation and I am sure you would love reading about HIGHWAY too posted at the site. However I am dying to see "Frandy" and would try to catch it soon. If i may ask,wht do u do for living? Regarding this there is a link of LINKEDIN in this "About Myself" only at the end which will tell you all about my professional engagements. And do let me know if you wish to know something else. If you can help me then please tell me the telecast time of "Uttar Ramayan" the serial by Ramanand Sagar in the Year 1989. I want to know its telecast time on 03/02/1989. As I can recall it was either 9am or 11am in the morning on Sundays.